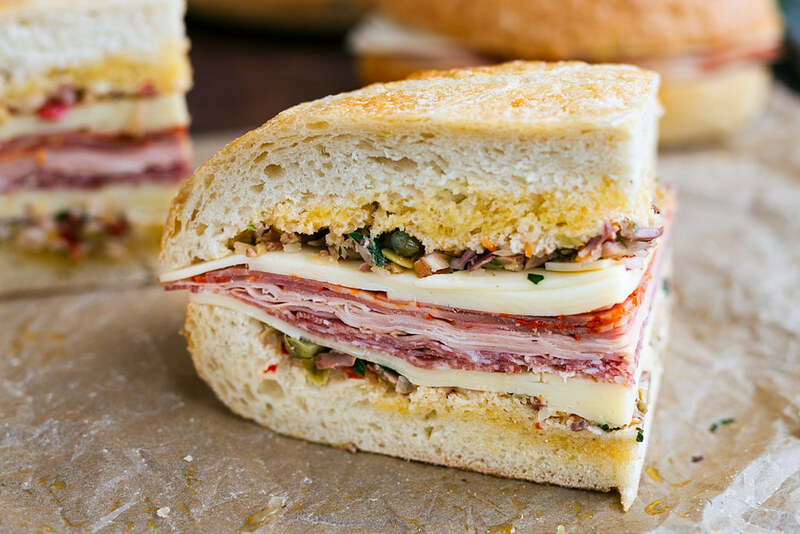 Get a taste of New Orleans with a classic muffuletta sandwich! Layered with Genoa Salami, Mortadella (Italian bologna), Capicola (ham), Provolone, Mozzarella, and a homemade olive salad, this indulgent sandwich is worthy of a celebration. Who’s ready to feast for Mardi Gras? They don’t call it “Fat Tuesday” for nothing, so get your finest stretchy pants ready and be prepared to indulge! Pre-Lenten festivities are held across the globe. Here in the States, New Orleans is the epicenter of the Mardi Gras tradition. There are so many fantastic dishes associated with Mardi Gras, from King Cakes and Jambalaya, to Dirty Rice and Pimm’s Cups. One of my favorites has always been the Muffuletta. At its roots, muffuletta is some of the best components of an Italian antipasto platter wrapped up into a sandwich of epic proportions. Its impressive layers of thinly-sliced meats and cheeses, paired with an olive salad spread, pack a huge flavor punch. 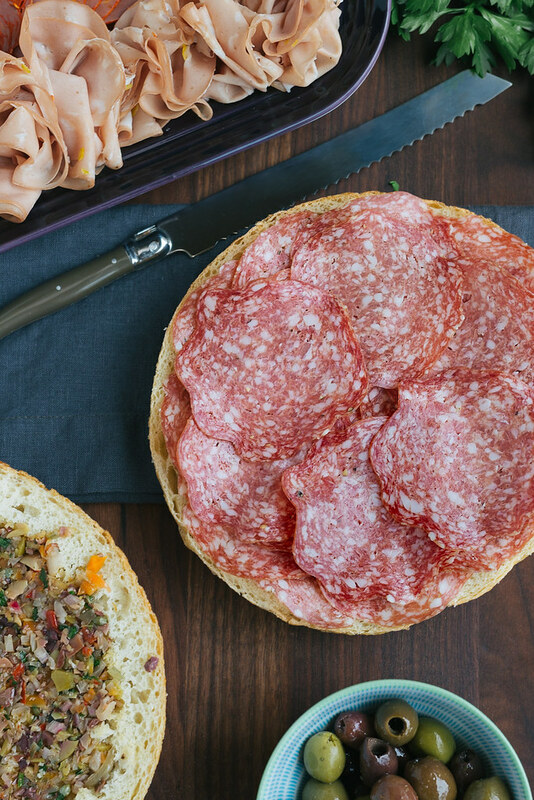 Muffuletta is perfect for serving a crowd for Mardi Gras, feeding hungry game day goers, or really any time the sandwich craving comes knocking. 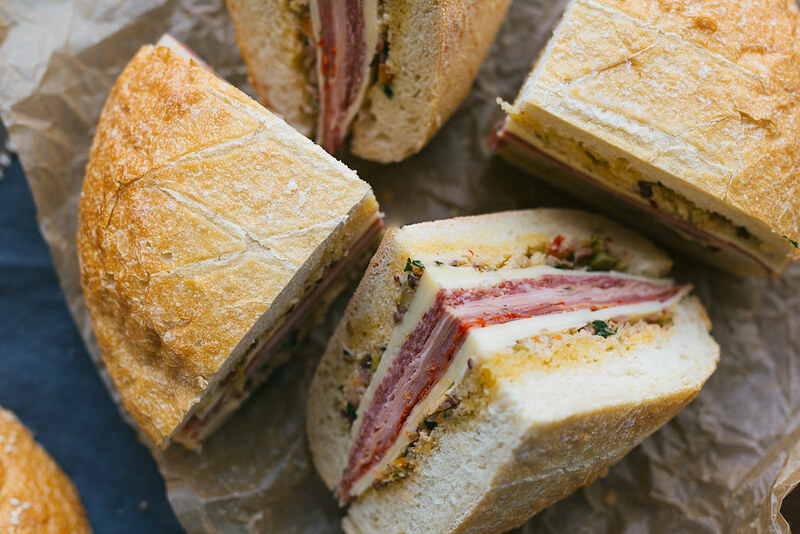 The origins of the Muffuletta sandwich trace to Sicilian immigration to New Orleans at the turn of the 20th century, and the iconic Central Grocery. 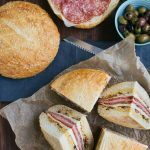 Traditionally, muffuletta is served on a soft sesame-seeded Italian round that is not overly thick. This exact style of bread can be difficult to find outside of New Orleans. As you can see from the photos, I substituted an 8-inch round boule from my local bakery. Focaccia rounds and ciabatta also work well for this sandwich. You don’t want a bread with a thick, heavy crust; it will be too difficult to eat. If the interior of your round, like mine, is on the “breadier” side, it’s best to hollow it out a bit to have the best filling-to-bread ratio. 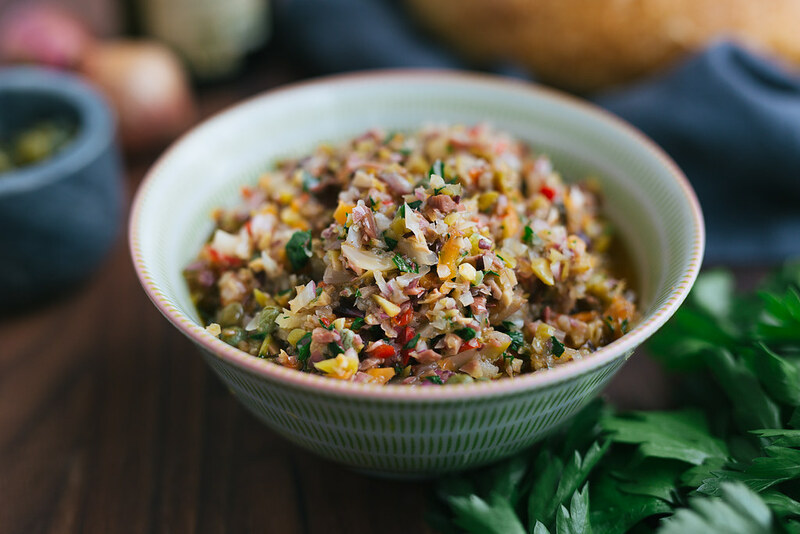 The most recognizable component of the muffuletta sandwich, aside from the bread, is the olive salad. If you have the time to make the salad the day before and let it marinate overnight, your flavor reward will be huge. I make my salad with a mix of antipasto olives, a traditional pickled vegetable relish called Giardiniera, shallots, capers, and herbs. 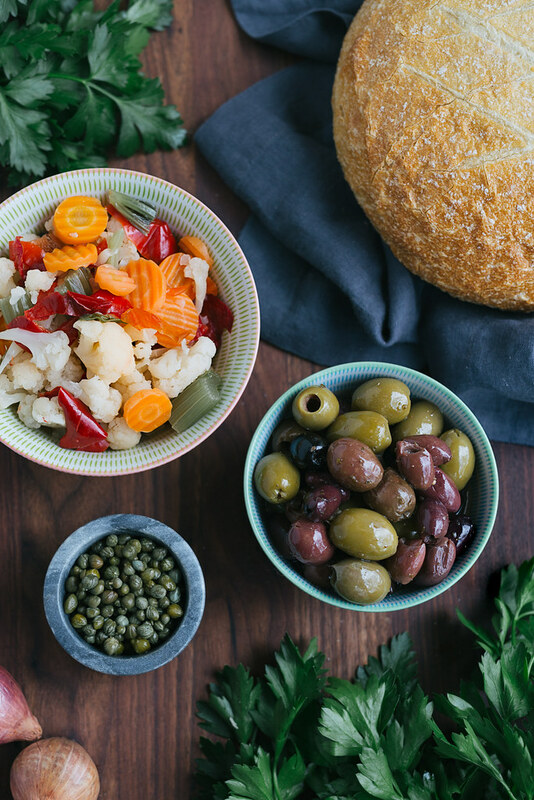 Giardiniera typically contains cauliflower, carrots, celery, and peppers. It’s salty, tangy, and just a little bit spicy (though, markedly “hot” varieties can be purchased as well). You can find it in the International aisle of many groceries, the self-serve antipasto bar, or at specialty Italian markets. Giardiniera can also be made at home, something I haven’t gotten a chance to do yet, but is on my “must try” list for soon. One last thing: for the perfect muffuletta, patience is key. It also helps compress the layers for slicing beautiful wedges. So, hands off for an hour! It’s a cruel request, and I know you will be hangry with me. I mean, I was hangry with me while cooking for this post. A few bites of the well-rested sandwich and I’m pretty sure I heard my tastebuds singing choruses of muffuletta glory. So, go! Get your Mardi Gras on with a taste of New Orleans! Building your Mardi Gras menu? Check out these recipes that caught my eye around the Web. Slice bread round in half. If it's thick, hollow out some of the interior to make room for the fillings. Spread each bread half with about 1/3 to 1/2 cup of olive salad (amount will depend on the size of your round, you might have leftover salad). 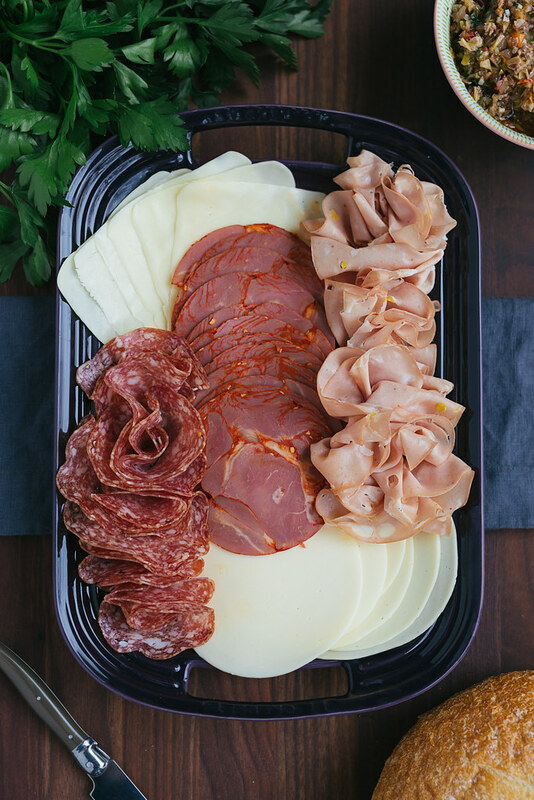 Layer with sliced meats and cheeses, place halves together, and wrap with plastic wrap. Weight sandwich with a grill press or a cast iron skillet and refrigerate for an hour. 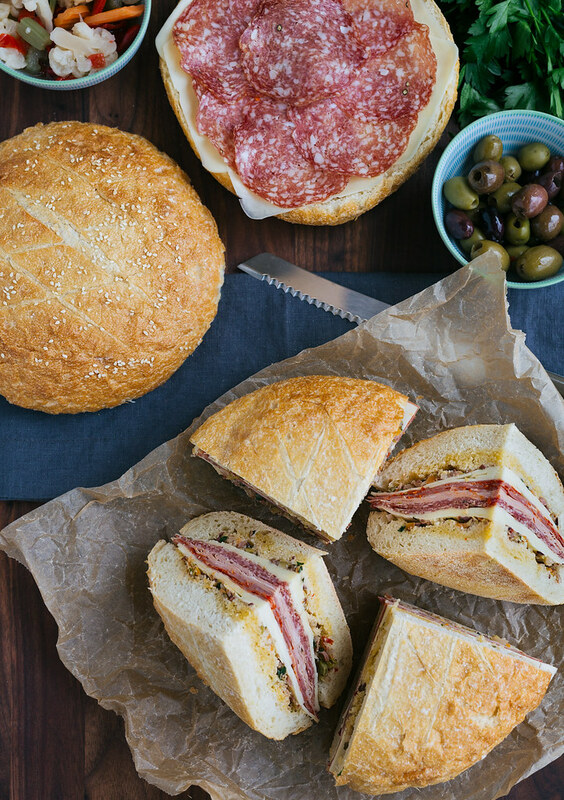 Unwrap, cut muffuletta into wedges, and serve. Traditional muffuletta bread can be difficult to source outside of Louisiana. As an alternative, look for a boule, round focaccia, or ciabatta that isn’t overly crusty. Sesame seeds are traditional. We like our muffulettas made with 1/4 pound of each of the meats and cheeses, but if you prefer a more substantial sandwich, increase to 1/3 pound each. New Orleans has some of the most amazing food, doesn’t it? This muffuletta looks more than amazing. I love that you use an iron skillet to flatten it out a bit. I can only imagine how the liquids soak up into that amazing loaf! YUM! This looks like an AMAZING sandwich!! My hubby would go absolutely gaga over this :) We have just planned our first trip to New Orleans for later in the year and I CANNOT wait – I have heard such good things about the food there!! I haven’t had a muffuletta in forever! You make it look so easy to do, and the flavors and delicious meats you have on the sandwich sound perfect! can’t wait to make my own! This looks like a lovely sandwich!! When I was in college I went to New Orleans and LOVED trying all the sandwich shops we found! This looks absolutely amazing!! Definitely going to try it! I’ve never heard of this sandwich before! I’m not much of a meat-eater, but the husband loves it- he’d devour this! That olive salad looks fantastic- I’d put that on anything! This is one of my favorite things about New Orleans…. and now I can make it at home?? I may need permanent stretchy pants… thats ok thought right? New Orleans is one of my absolute favorite cities- the people are so nice and the food is SO delicious! I went to New Orleans on business one about 9 years ago, shortly after mardi gras and had my first muffaletta and I was hooked! The spread was definitely my favorite part. Oddly, I’ve never tried making it at home. Yours looks seriously delicious- I think I may just need to try it! Thanks for sharing!